Musical theatre lovers will be asking for more next week as Ponteland Repertory Society stages its latest production. Oliver! f is the story of a young orphan boy who is destined for more than just the workhouse. He escapes life as an undertaker’s apprentice and heads to the misty city of London. Oliver quickly mixes with the wrong crowd and turns to a life of pick-pocketing under the watchful eye of The Artful Dodger and the ruthless Fagin. In the mix of all this is the struggingly relationship between the wicked Bill Sykes and warm-hearted Nancy. Despite it’s dark themes, the show is littered with superb, toe-tapping songs, including Gotta Pick a Pocket or Two, Where Is Love, Food Glorious Food, Who Will Buy, and many more. The group is now in the final stages of reheraslas for its latest production, but it is no stranger to the process, having been performing plays and musicals since 1927. Because of licensing rules, the group has had to double some of the younger roles. William Aycliffe, who lives in Scots Gap, and Cameron Davison, from Consett, are joining Ponteland Repertory Society to share the title role. They will be joined by Ponteland High School students, Andrew Potter as the Artful Dodger and Hannah Elliott as Bet. Returning to lead roles are Jonny Woollett as Fagin and Lucy Walton, from Ponteland, as Nancy. The children in the production include The Preppies, the Rep’s Youth Theatre, with Lucy taking on the role of assistant leader of the group. Preppies has grown in numbers from the original eight to more than 40, and all of these young people will be taking part in the show. Oliver! 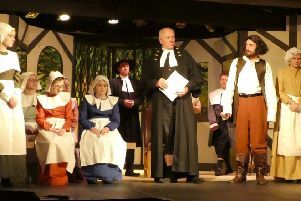 will be staged at Ponteland Memorial Hall from Wednesday, November 25 until Saturday, November 28. Tickets are available from £6. Visit www.pontelandrep.co.uk or call 01661 871161.